ADIDAS LEGGINGS | These leggings are on a crazy discount ($25!) and my local Nordstrom was completely sold out of them within HOURS of the first day of the sale for cardholders. I got to my store at 2:30pm and they were totally wiped out, even though I checked their stock that morning! ADIDAS TANK | Luckily, this tank was still available at my local Nordstrom and I picked it up because, hello, $21. Adidas is making a big comeback if you haven’t noticed yet, and this top is perfect for casual days or working out. It runs large, so you may want to consider sizing down. LEOPARD LOAFER | I’m obsessed with leopard footwear because I feel like it adds a subtle pop of intrigue to an otherwise basic outfit. Loafers are comfortable yet more elongating to the leg than a rounded ballet flat. MOTO JACKET | If there’s ever a time to pick up a leather/pleather moto jacket, it’s during the #Nordstrom because they always have incredible prices. These jackets aren’t on sale often because they’re so on trend, so take advantage of this one under $65! LEITH MIDI DRESS | I wore this dress in blush pink on my Instagram and it’s so pretty! Perfect for work or play and I love the fall color options. ARTICLES OF SOCIETY BLACK JEANS | I’ve talked about Articles of Society jeans a few times. These jeans hold their shape and have an amazing amount of stretch to them, so you’ll never feel constricted (yet you’ll always look sucked in all the right places). Black jeans are a staple year round, but particular in fall/winter, and you can’t beat the insane $38 price! HUNTER RAIN BOOT | I got these exact boots during the sale last year and they’re my favorite ‘investment’ piece. They’re $119, but these boots are going to last me the rest of my life. They’re the most sturdy rain boots ever and I love the shorter boot height for my body (5’3″). These will keep your feet warm and dry through the cold rain and/or snow. LUSH ROLL TOP | I have this top in a longer tunic version, but this one happens to be on sale for $27. These tops are a staple for work or play. They pair great with work slacks or jeans and Nordstrom always has a ton of colors (tip: both this style and the tunic go on sale often if you end up loving it and want more colors later). ZELLA CROP LEGGINGS | If there’s nothing you order from this list, let it be THESE workout leggings! I first tried Zella last year after hearing one of my favorite YouTubers, Alexandrea Garza, rave about them. They’re just as good (if not better) than Lululemon and I think they’re way more flattering. The high waistband is key and I love the mesh cutout on the calf. Have you shopped the sale? What did you pick up or planning on picking up? Let me know because as of now, these are literally my only hot items from what I’ve seen. Keep me posted! 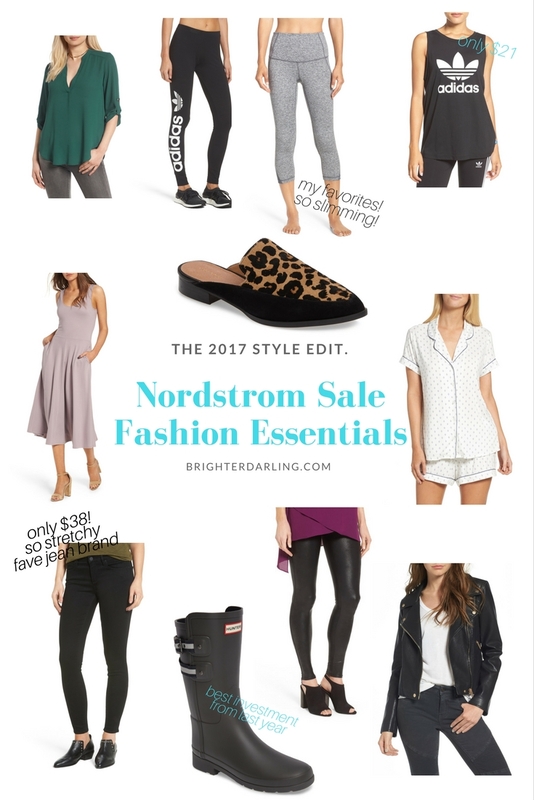 Don’t forget to check out my Nordstrom Sale Beauty Must Haves because those are amazing! "Behind the Beauty: How Well Do You Know Me TAG"